Australia’s Sydney Dragway, with the assistance of Gulf Western Oil (a local lubricant brand), held its “Mega Race” over the weekend with entries coming from all over eastern Australia and even America in an effort to win a $20,000 pot of gold. 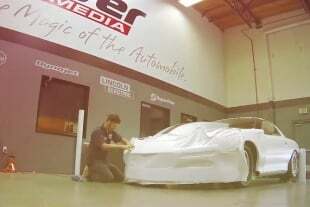 The headliner was backed up by a ten-car strong Aeroflow Outlaw Nitro Funny Cars class as well as a Pro Extreme/Doorslammer bracket. The Mega bracket was broken into two parts – High ET and Australia’s Best Sportsman for the quicker cars. The winner of each bracket then went on to face each other at the end of the night for the overall title. Twenty-seven entries faced the starter in the quick bracket, with South Australian Simon Barlow top-qualifying with a 6.704 in his Chevrolet 632-cube rear engine dragster. Barlow would carry this momentum right through the bracket and reached the final. In the High ET bracket, American Chance Lykens had the lowest dial-in with an 8.42 from his similar 468-cube Chevrolet rear engine digger. Alas for Lykens, eventual local finalist, Joe Kabboura in his Falcon utility put him away in in the opening round despite his U.S. rival leaving with a better reaction time – however, a 0.02 over 9.107 ended up turning back Lykens’ slower .012 over 8.546. Facing Barlow in the final of Australia’s Best Sportsman was Brendon Luke, in his small-block powered rear engine dragster. Despite running a great 6.706 on his 6.700 dial-in, Barlow wasn’t as sharp on the tree and his not-too-shabby 0.31 was sunk by a very keen .003 light that when paired with a solid .016-over 7.906 took the gold. In the High ET bracket final Kabboura’s Falcon was paired up with another utility vehicle, the Toyota Hilux of second-generation racer Thomas Leake. As was the case above, a double-oh light was what it took to win the money when Kabboura’s .005 and 0.040 over 9.080 forced his opponent to break out (with a .002 under 8.448) on an 8.45 dial-in. These two winners then went into the grand final for a chance to win the gold. 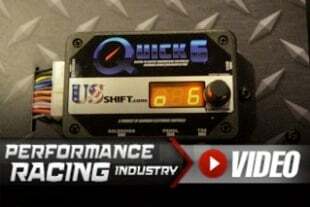 All day Kabboura’s reaction times were superior to Luke’s and this was the case again when a .029 reaction (his slowest for the day) and 0.044 over 9.104 was too good for his opponent’s 0.73 light and 0.065 over 7.955 time. After the event Kabboura told me that this was his a win to savor. “I’ve been runner-up a few times but this is my biggest win,” he admitted “The car was strong all day and we managed to keep on top of our dial-ins but I think the biggest factor was lady luck,” he continued. 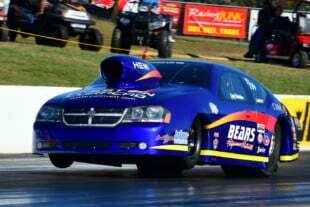 The Aeroflow Outlaw Nitro Funny Car series plays a major part in Australian drag racing going from coast to coast at major and country tracks – this was the 26th event. The brainchild of former racer Graeme Cowin, ten cars made it to this event. Overall, ’57 Chevys have been dominant winners as going into this event Rick Gauci had won fourteen times in his “Nitro Express” while Shane Olive had won six in the “Red Devil” Bel Air. 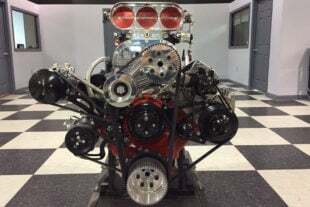 “The motors that we use are Alan Johnson Performance Engineering 413 cubic-inch TFX engines with AJPE heads, and Littlefield LB22 superchargers that we take straight off the shelf (at Rocket Industries, Aeroflow’s parent company). We just want to make everything really simple at the track — this makes it easy for the crews, though that said, I damaged a head on my own car during second round competition,” McMillan admitted. After the second lot of pairings only two cars had won both rounds – Gauci and Paul Messinio in the “Dark Horse” Mach 1 Mustang, so on paper they had the best chance of winning on the night. The two faced each other and Gauci used all his experience (and Cowin’s tuning ability) to win his 15th Rocket trophy. “The car put the front wheels up and drifted to the left,” Gauci admitted after the run. “Despite that I managed to bring it back to the center of the lane and went on to take the win. GC (Cowin) makes this car so consistent, despite not having a data logger and only reading the spark plugs. 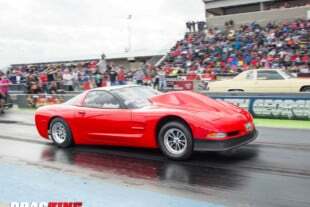 In the final he also tuned it up so it ran the 5.429 that was good for low E.T. of the meet (and 268.06 that was top speed – Ed),” he continued. The Pro Extreme/Doorslammer bracket saw a mix of supercharged Top Doorslammers (our Pro Modifieds) as well as a number of turbo cars and a nitrous entry from New Zealand. 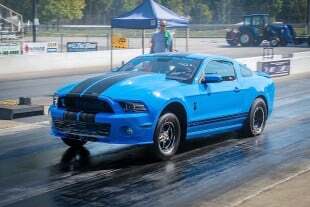 In qualifying, after Paul Mouhayet ran a 5.734 in his Mach 1 Mustang, and Greg Tsakiridis came out and ran a 5.694/271.79 in his Pro Line-powered Pony car. Mouhayet came back with a 5.665 but after one of their crewman was injured they packed up and left for the day. Tsakiridis had an injector fail, burning a piston that put him out, leaving George Rehayem in his 20B Rotary-powered Mazda 6 and Michael Haimandos’ turbo Mustang in the final. Pro Extreme finalists Michael Haimandos (left) and winner George Reyahem. This saw a tremendous race ensue with Rehayem grabbing the holeshot (.047 to a .079) over his opponent and the two cars remained fender to fender for the who race. Rehayem was never headed as he crossed the finish-line with a winning 6.401 to an oh-so-close 6.404 – simply awesome racing. Video: Nostalgia Nitro Funny Car Racing In Australia Is No Joke!